A “push-on” – “push-off” motion that eliminates the guide or hook hang-ups. A rod protector of your valuable investments from scratches, guide damage, line breakage, and rod locker damage. Features a tough, double layered, size color coded, reinforced tip which protects your rod tips, & makes loading into rod tubes fast, easy, prevents tangling. Added benefit for co-anglers to help keep rods tangle free and easily accessible in a limited space. Easy and safe way to transport your rods. Constructed with the highest quality mesh and tightest weave to avoid guide puncture or damage. Our rod sleeve, rod covers are available in extended lengths to fit longer rods. Improved Mouth – The new and improved pliable, rubber-type “mouth” on the bottom end of the Rod Sox seals the mesh from fraying or unrolling, as well as protects the rod paint from any scratching from open mesh. In addition, the rubber mouth provides about a 1 3/4″ protective barrier between the hook and the mesh to prevent hang-ups. Mesh Density – The Original Rod Sox have the densest mesh of any rod protector on the market. This makes them more durable over time, improves the protection of your rod, and allows a tighter weave for added safety of rod guides, especially micro-guides. Safety Tip – The tough, double layered, size color coded, tapered tip of our Rod Sox protects the last guide/tip of rod from the wear and tear of placing or removing rods from rod lockers or any type of storage. Tangle Free – Avoid the tangling of rods and line when toting gear to and from the water. Durable Tag – With the addition of a hang hole in the new, durable, rubber tag, rods can now be “hung up” for storage, a great and safe way to save room and keep your rod out of harm’s way laying or leaning elsewhere. After the Rod Sox is completely seated on the rod, with a gentle tug on the rubber mouth it will “lock” the Rod Sox in place, and it won’t slip off. 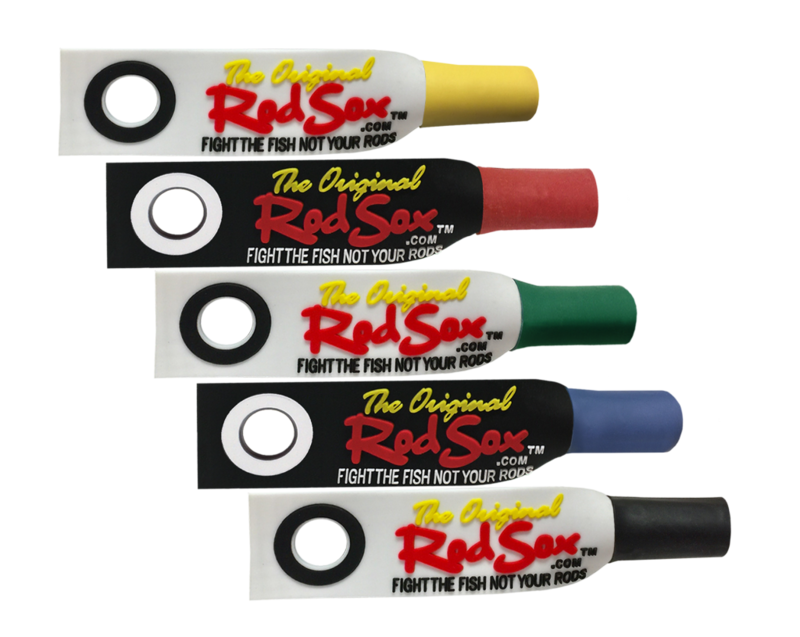 When it’s time to go fishing, a simple push of the mouth upwards releases the “lock” and the Rod Sox will just slide right off.